With an iron mermaid door knocker and an open door. An elaborate ironwork web reveals an inner courtyard. A powerful 16th century Spanish entrance with Lion door knockers. 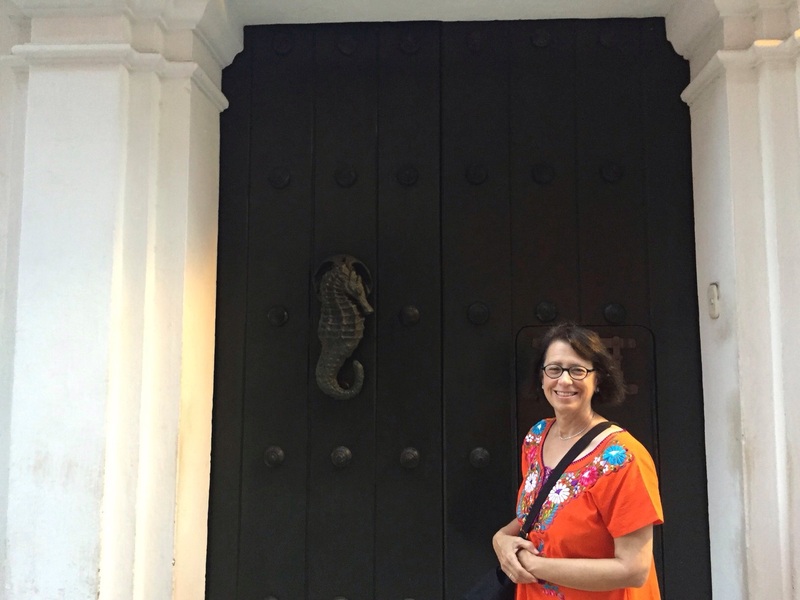 Jan with a powerful Sea Horse door knocker. To open these doors takes great imagination. Not just the physical strength to move the creaking centuries of history with one knock on the door, but the attempt to see not only a city, its story, but indeed an entire continent through a process of perpetual opening and closing. 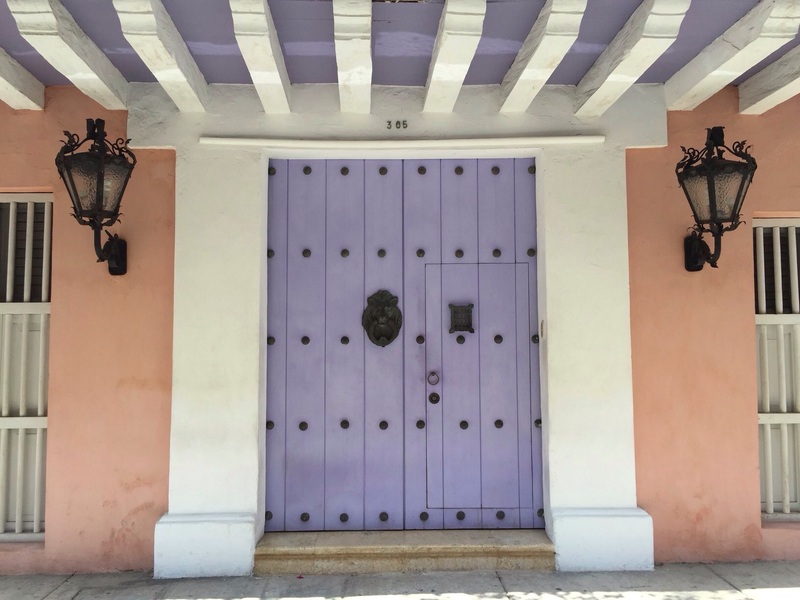 My guides into these Cartagenan portals, suggestive labyrinths of South America itself, were the novels and stories of Gabriel García Márquez, Colombia’s literary Prodigal Son. 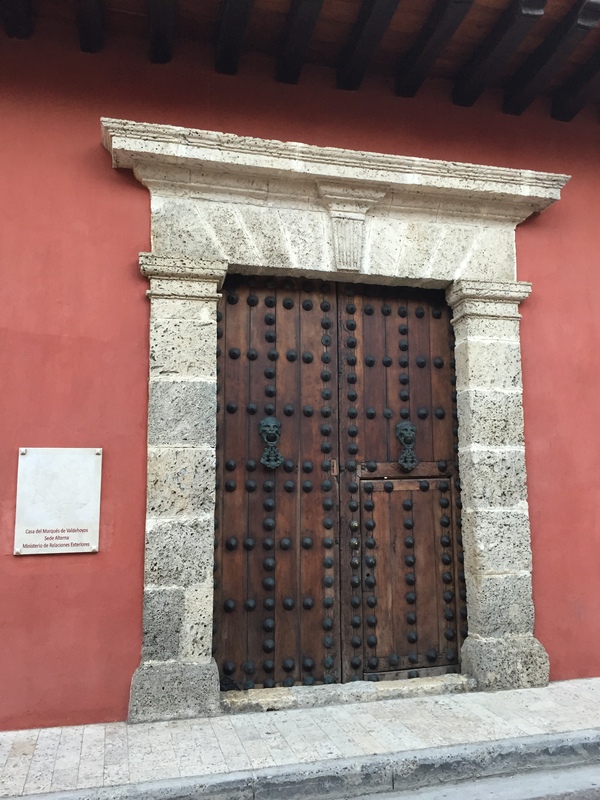 At the door of the sinister Spanish Inquisition Museum, a haunted world evoked in Márquez’s Love and Other Demons. It’s not NetFlix, but I binge read authors. 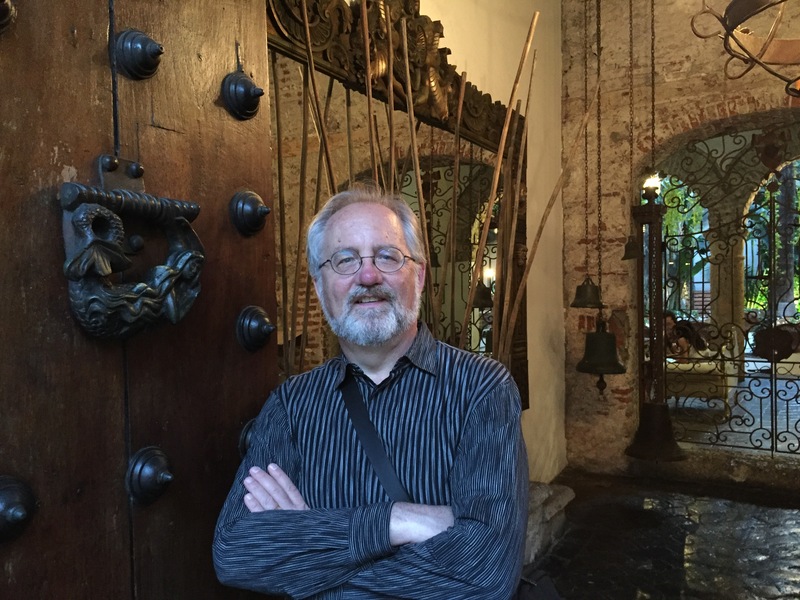 Reading is, for me, an essential ingredient to strong artistic programming for my Los Angeles International New Music Festival, the Hanoi New Music Ensemble and various projects and ideas with Latin America. For example, when I performed John Cage’s Muoyce II for one of our festivals, I read in succession Joyce’s Ulysses and Finnegans Wake to prepare for Cage’s esoteric compression of Ulysses into one hour, which helped me walk onstage facing critics and audience. For Hanoi, the history shelf in our house is much larger now than ever imagined. My rule of thumb is at least 2,000 pages per subject to become comfortable with the background of ideas influencing my musical and real world decisions. Programming is not for the faint of heart and Mom always said do your homework. For my Latin American ideas under construction, this means hitting the books of Carlos Fuentes, Octavio Paz, Gabriel Garcia Marquez, Jose Saramago, Pablo Neruda, Mario Vargas LLosa, Isabelle Allende, and returning to Cervantes along with the contemporary accounts of the 16th century Spanish conquest. And to act upon the encouragements of Mexican friend Ricardo Gallardo and visit Colombia to get a feel for South America! 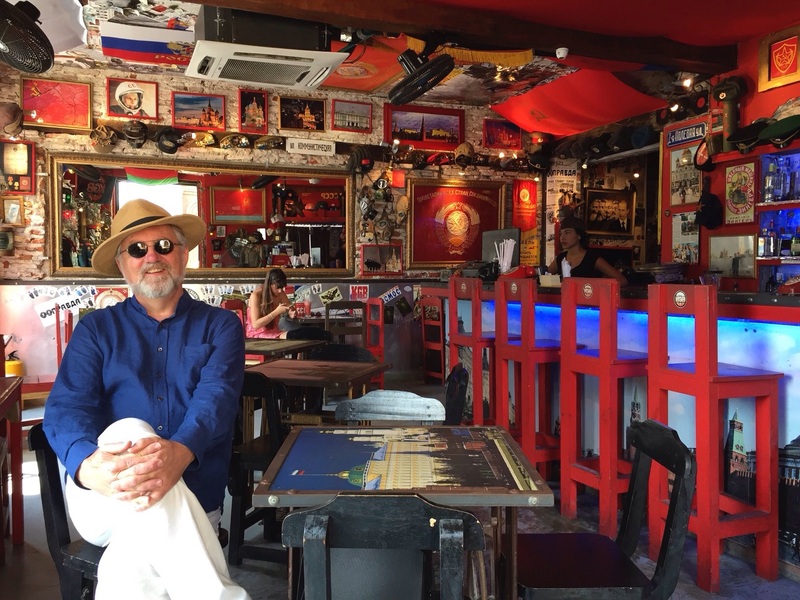 Jan secretly caught me at a coffee shop reading Márquez in Cartagena. What I will say about Márquez is that Jan and I both have a soft spot for Fermina Daza and Florentino Ariza, the protagonists of the unique love story that is Love in the Time of Cholera. With an alphabetical symbolism inverting a commonplace notion, they proceed from Z to A through their shared last names, as does the book. Jan at the Portal de los Dulces arcade. 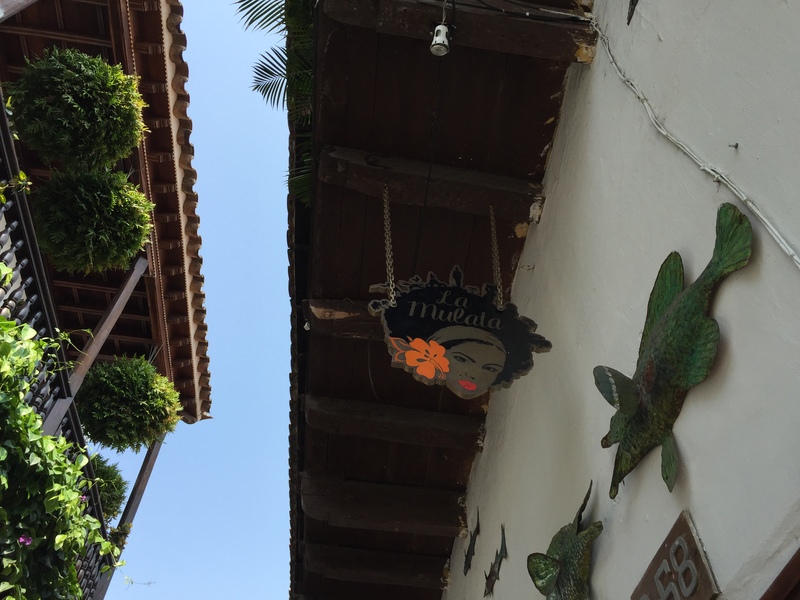 You are safe in assuming that all of Cartagena serves as a backdrop to some of Márquez’s novels. 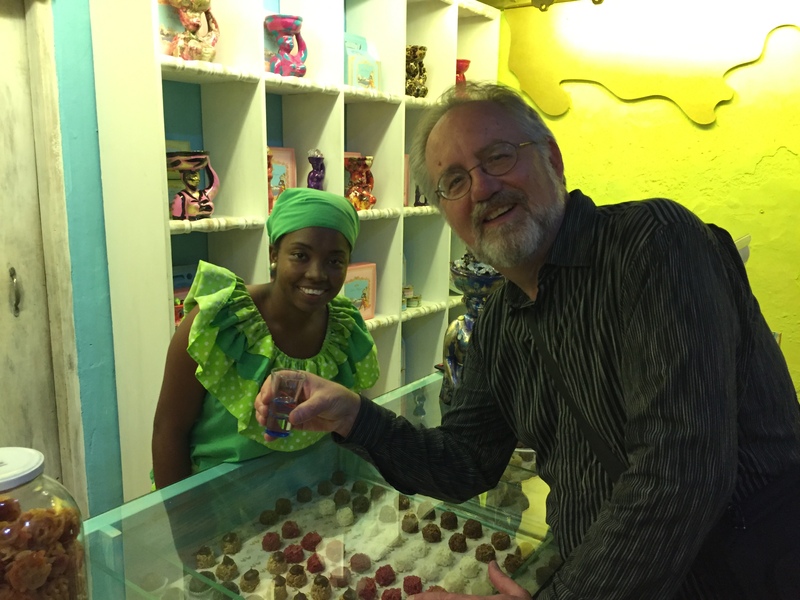 One that I imagined with great curiosity before visiting were the various shopping arcades he describes, in particular the Portal de los Dulces, a magical place you see above, where the entire arcade is devoted to candy and sweets. Not to be missed and loving coconut anything put us both in a momentary childlike state of mind! The home of Gabriel García Márquez in Cartagena. I’m not indifferent to history, but neither do I search out “Washington Slept Here” tourist gimmicks. What I search for are sounds, as in the the music and language of a culture, street grid locations, architecture, weather, local vendors, and of course restaurants. But Jan determined one important location. 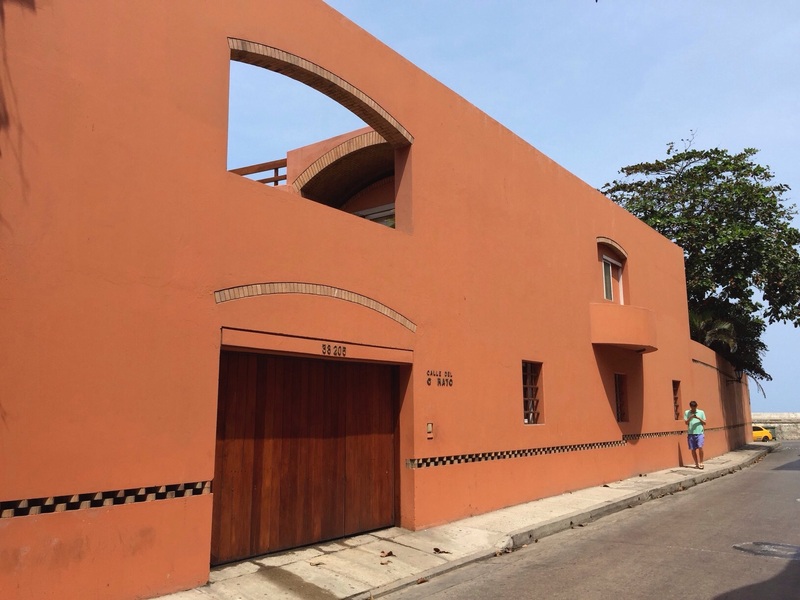 It’s probable that Fermina Daza’s house was down the street from Marquez’s own home. The house of Fermina Daza on the Plaza de la Madrid. The plaza where Florentino Ariza waits for Fermina Daza. 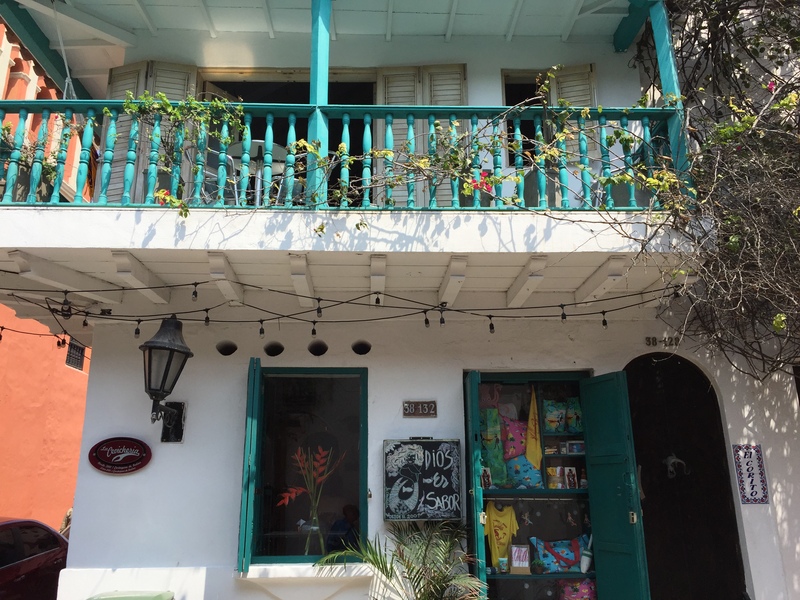 But what’s much more realistic than the imaginary potential of discovering literary stage sets are the real time coffee shops and restaurants all within a stones throw of Márquez’s Cartagena home. I hope you’re hungry! AT KGB Coffee in the Plaza de la Madrid. 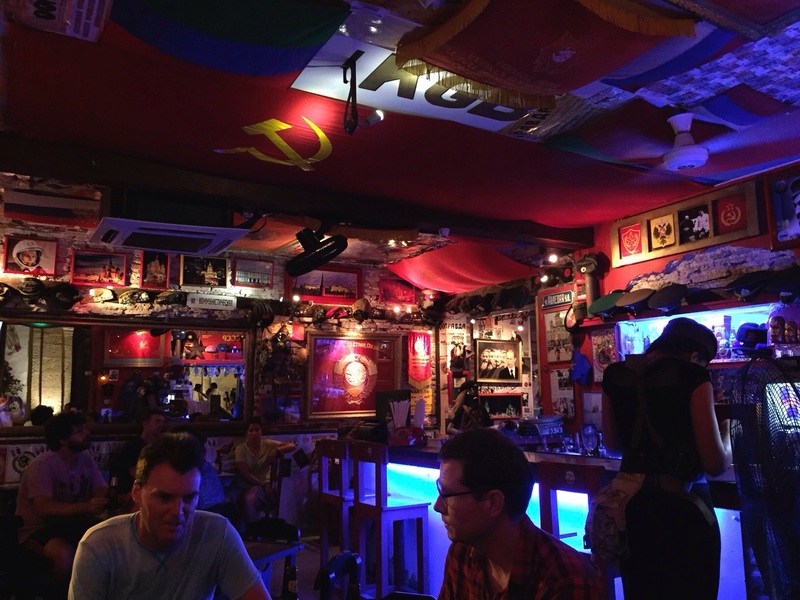 Plotting revolution seems appropriate in South America at this Soviet Union themed coffee shop! For our first lunch we went just a few streets away from Plaza de la Madrid and found La Mulatta. The restaurant is the best combination of great food and affordable prices. Atmosphere is authentic and it’s packed to the rafters with locals, also a good indication. La Mulatta is a great place for African inspired dishes. Shrimp ajillo and a fish cazuela with coconut rice at La Mulatta. While I’m on the topic of lunch, there is another place highly recommended, and its literally got Márquez’s home almost in plain sight. Try La Cevicheria, which has the benediction of CNN’s nomadic eater Anthony Bourdain. Travel Tip: Arrive when they open if possible, as there is usually a long line. Though a good sign, the place is charming when it’s not pounding with customers a little later. Make sure to find La Cevicheria. Another Weather Alert: Cartagena is on the Caribbean and can be a bit steamy, like most equatorial places. We were there in March, when the breezes were out of this world. It’s as if nature provided a tremendous air conditioner. So though hot and steamy, we often would be almost blown over by strong wind gusts (something you’ll experience in Márquez’s world of magic realism). But humans adapt to weather. 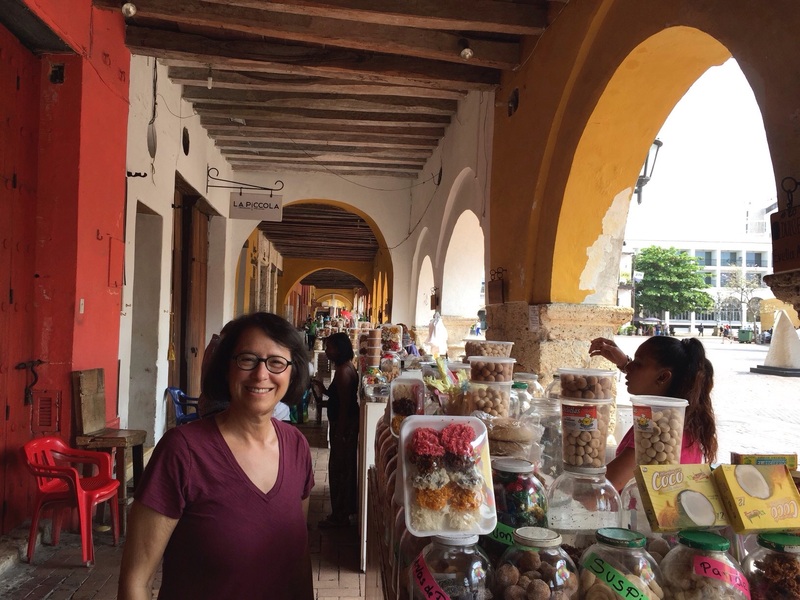 Which in Cartagena means you’ll have a lot of choices of gelato, ices, evocative fruit pastelles (ice cream on sticks), coconut and tamarind macaroon type treats are everywhere, French pastry shops abound, and fruit juices might be the best on Planet Earth. Just stroll around and give somebody a try. A tremendous way to beat the heat! Have I mentioned that Cartagenans are among the friendliest people on the globe? Just look at these smiles, which need no translation! 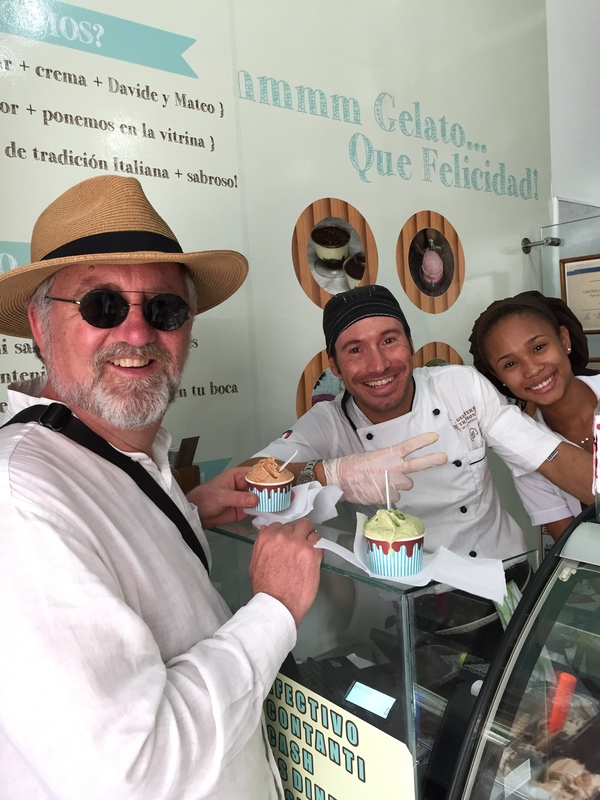 Happy Italian and Afro-Caribbean makers of gelato. My first taste of aguardiente at Milagros Dulce. With The Nicest Server on Earth, Dani of El Boliche. Márquez, whether he knew it or not, created one hell of a neighborhood, because all these places are just strolls from each other! And Dani, part of the great team of servers at El Boliche, has one of the biggest hearts we’ve ever encountered. We just might return soon to Cartagena to see her again! No pictures yet as I’m going to devote an entire blog post to El Boliche. Its head Colombian chef has trained in San Sebastian in Northern Spain, and it’s a place that is small so you’ve got to squeeze into maybe six tables tops. 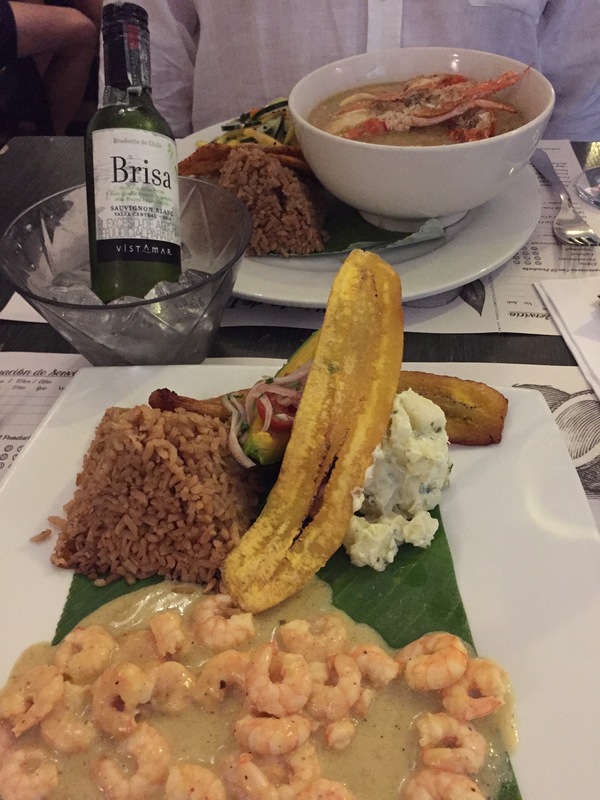 How do you cook as a traveller in Cartagena? Make reservations for El Boliche! 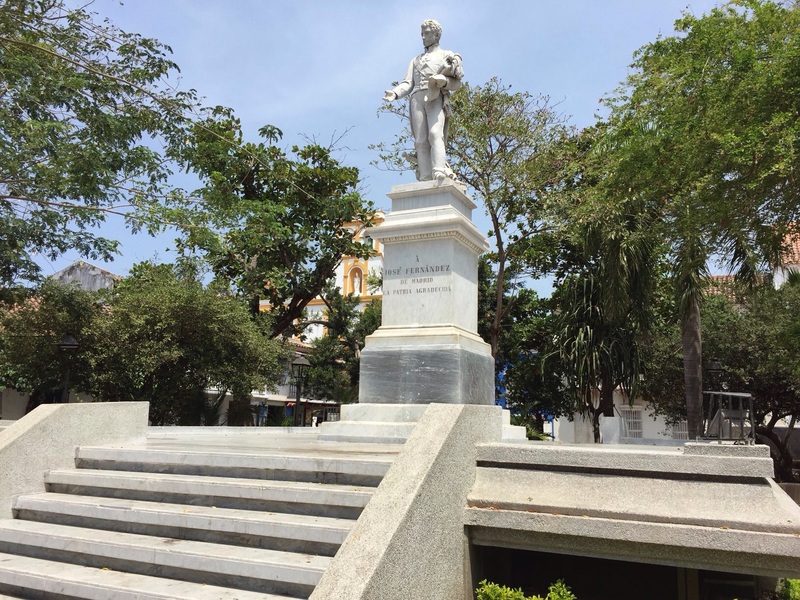 Márquez’s description of the Plaza de Bolivar from Love in the Time of Cholera evokes a memory that one can still find in a Cartagenan illusion. See for yourself! 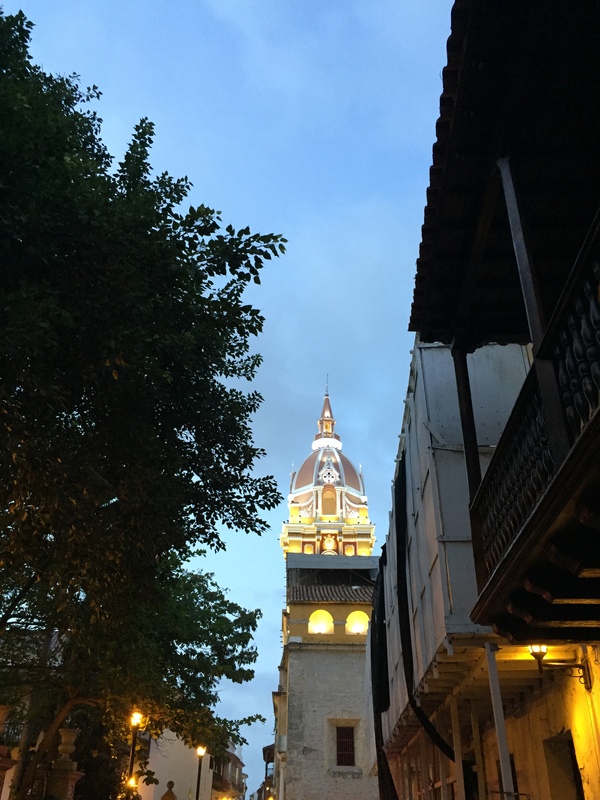 A twilight view of Cartagena’s Cathedral, complete with the ever present balconies found throughout the city. 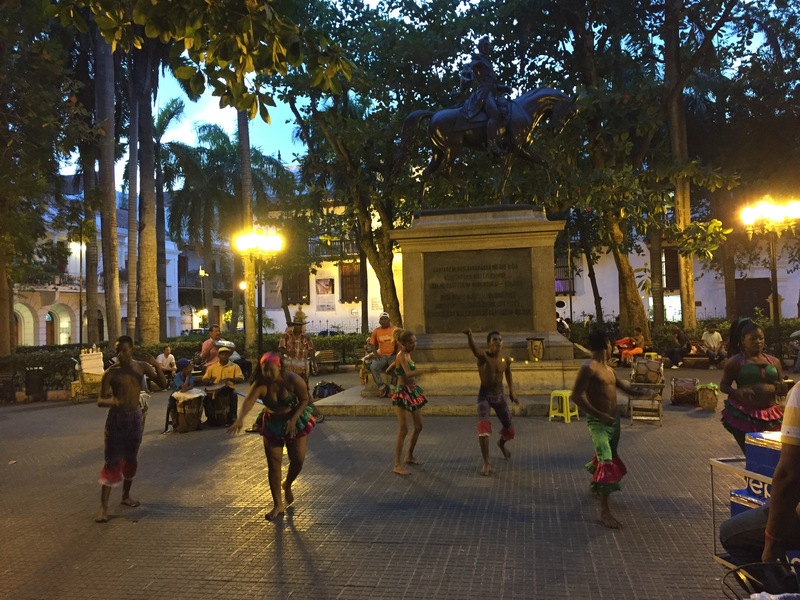 An Afro-Caribbean dance performance before The Liberator’s statue in the Plaza of Bolivar adjacent the Cathedral. 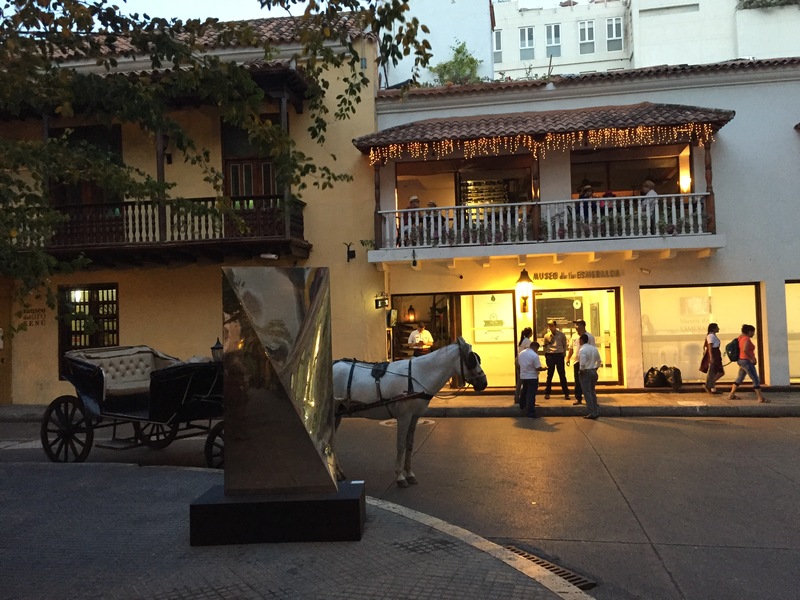 The clip clop of carriages provides the illusion of memory in the Plaza of Bolivar by the Cathedral. 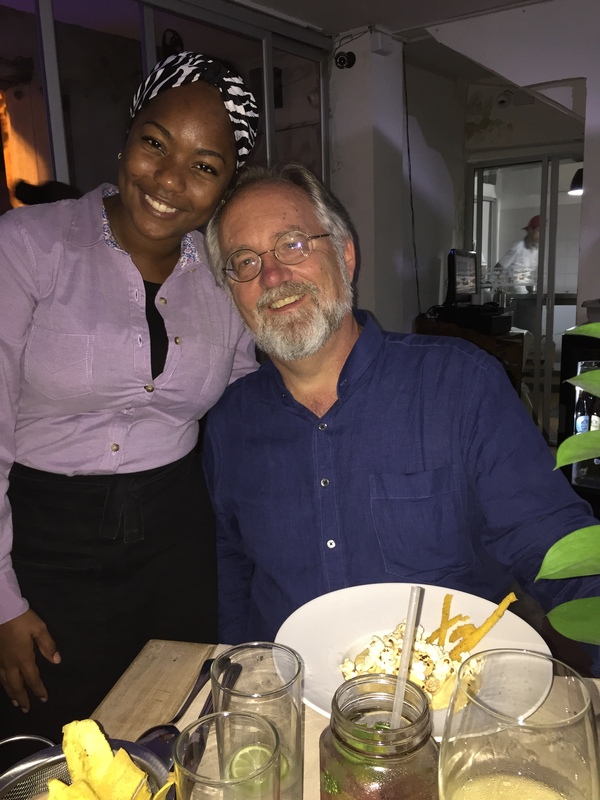 I’m happy to return soon to Cartagena with more blogs, and expect a full post focusing on my favorite ceviche in this Caribbean wonderland of fresh seafood at El Boliche. 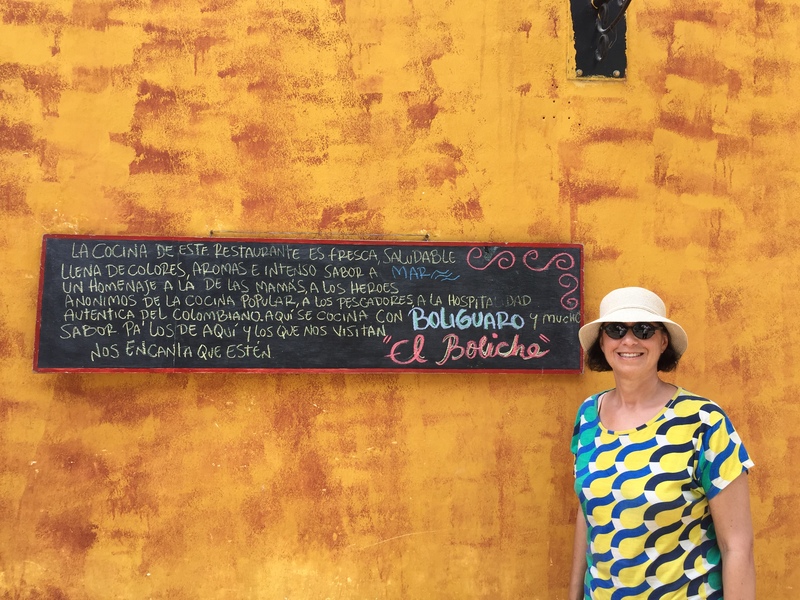 Jan against the colorful wall and sign of El Boliche in Cartagena. So here are two Travel Tips. First, follow the lead of creative artists to dream of travel. Read a novel about where you want to go, or even better reverse the equation: because of a book you read put a destination into your dreams. Guide books are not the only portal to get ready for a journey and our libraries still make literature and hardcover books available for free. It’s no wonder Cartagena was virtually shouting at me for a visit, as Márquez set Love in the Time of Cholera and Love & Other Demons there. Secondly, before you go anywhere, be curious about the history of your destination, which by definition encourages multiple perspectives. I was fortunate to study history with mainly Jesuit priests in high school, and they demanded we observe history from every possible angle. My American history class began by examining Genghis Khan, Marco Polo and the spice trade routes, something that came back to me last year when I finally arrived on Penang Island in Malaysia. I’ve been amazed at how quickly people smile when you demonstrate even a beginner’s grasp on the events that shape their country. AT KGB at night across from Santo Toribio Church. 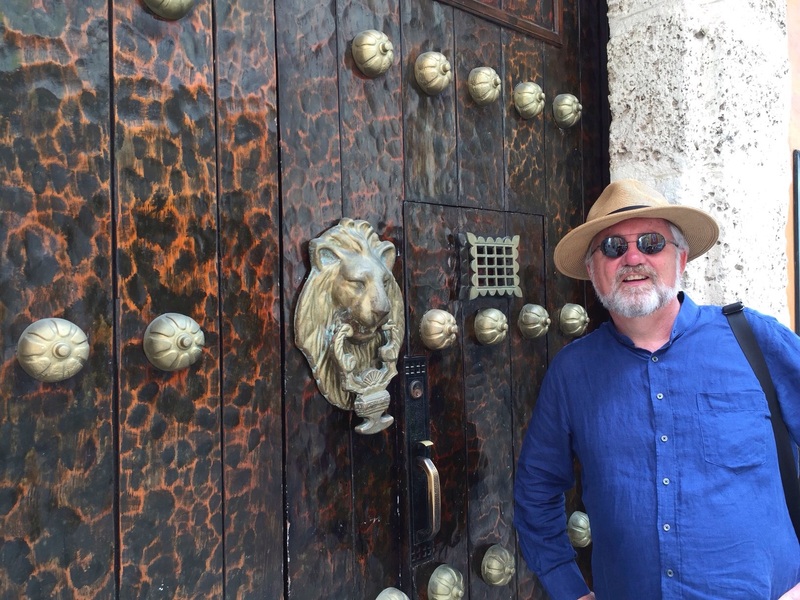 And one last memory about the doors of Cartagena. 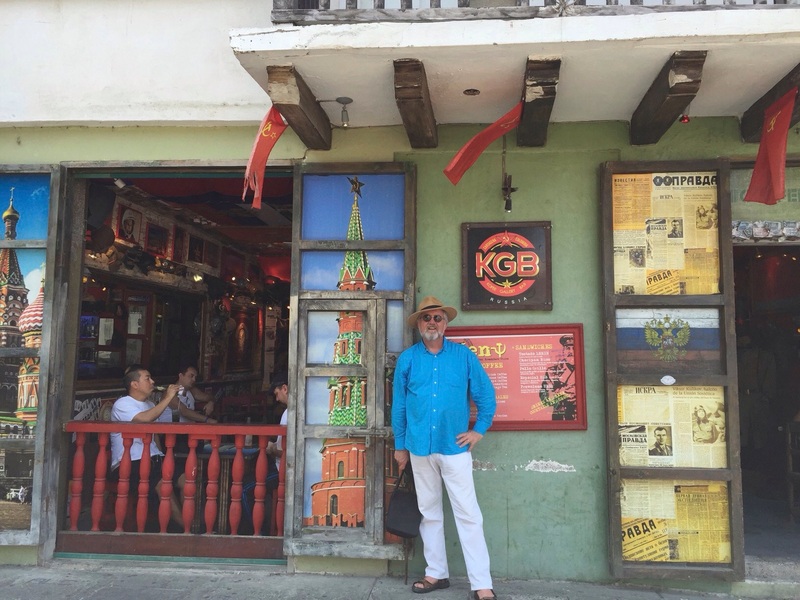 During our first night walking around, we found KGB, the communist inspired coffee house on the Plaza de la Madrid in the neighborhood of Marquez’s home and restaurants La Mulatta, El Boliche, La Cevicheria and the home of Fermina Daza. 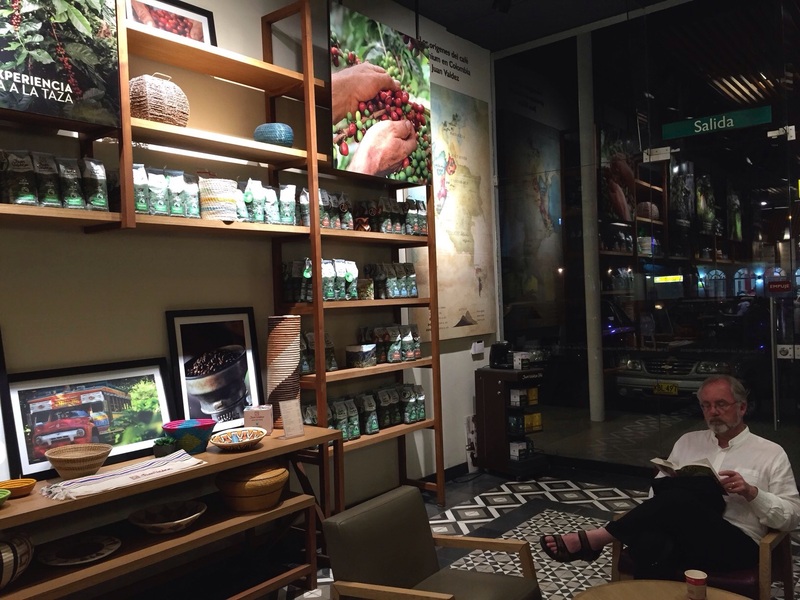 It reminded us of Cong CaPhe in Hanoi and seemed to be a Latin American sibling to our favorite coffee shop in Vietnam. As you stroll around Cartagena, you cannot help but notice the extraordinary dress shops for elegant evening fashion. Each shop seemed to outdo the next. 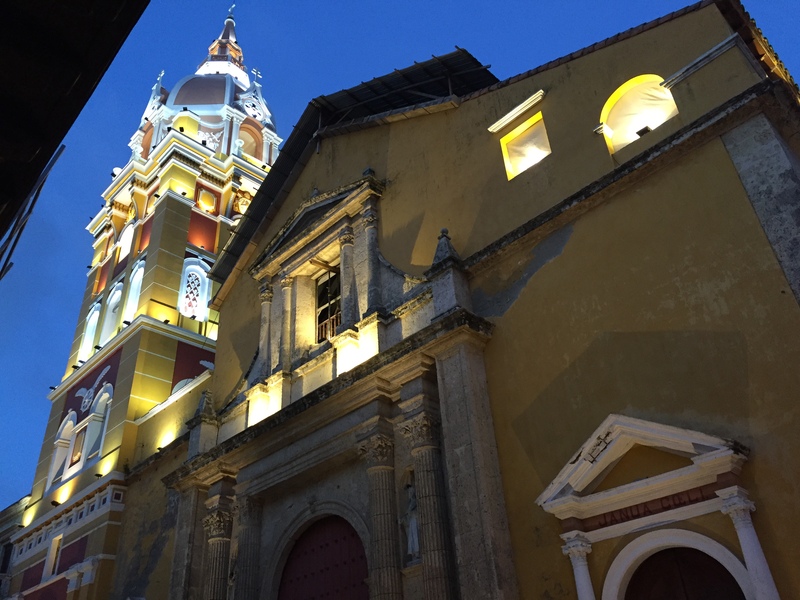 When we arrived at KGB, we were lucky and got two seats right across the street from a church, Santo Toribio. As we sipped our coffees, a steady and amazing stream of people kept arriving, from horse carriages, taxis, cars and on foot. Obviously a Saturday night weddding was underway (we were waiting to head to El Boliche for a ceviche dinner). Nothing is random! We had prime seats for a full blown Cartagenan fashion show, which kept coming and coming it seemed without stop. But the huge door of Santo Toribio Church remained closed shut. As dusk turned into night, seeing clearly each stunning dress and excited person was getting a little more challenging. And then, all at once, the church door was flung open, the choir’s voice soared into the entire Plaza de la Madrid and the luminous church flooded the now darkened street, lighting up our table across the narrow street. 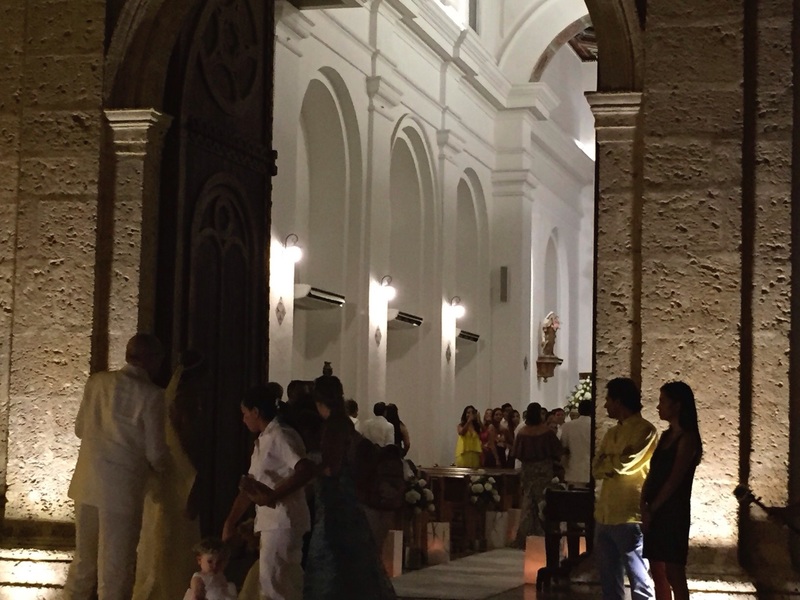 The church door magically opened for a wedding on Plaza de la Madrid. And for one brief moment, Jan and I could feel Márquez’s magic realism come to life, as if in a dream we witnessed a newlywed couple start their life’s journey next to the home of Fermina Daza and her patient lover, Florentino Ariza. Cartagena de Indias. A place where doors open and close all the time.